This economical digital teslameter will allow students to incorporate quantitative measurements into their magnetism experiments. 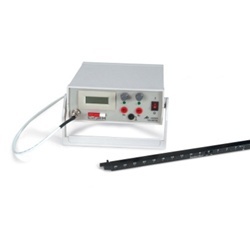 The unit includes a Hall sensor probe for measuring axial and tangential magnetic fields up to 200 mT. The probe also serves as a ruler as it includes a metric scale. There are two measuring ranges, 0-±20 mT and 0-±200 mT. In addition to having digital display, the unit outputs a voltage proportional to the magnetic field which can be measured with a data logger, XY-recorder or analogue multimeter.